find it the other book. That brown & white thing on my dashboard is a peanut butter sandwich. I became very proficient at making peanut butter sandwiches. I can read a map, make a sandwich, and drive a stick shift up a mountain at the same time, blindfolded. 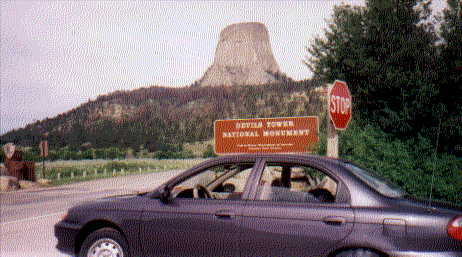 Departed Sheridan, Wyoming at 5:30 AM headed to Devil's Tower, WY. I HAD NO ENCOUNTER OF ANY KIND. Walked around, strolled the gift shops. Bought post cards, mailed 'em. Hit the road! Above: The Penny Motel & Hostel. Glad I stopped here. Just what I badly needed--a break somewhere where it was cool, clean, and quiet. Had the room to myself again. Great air conditioning. Took shower, changed, and took a slow walk around Deadwood. Hadn't decided exactly where I wanted to spend the night. 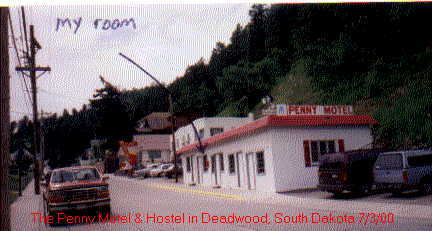 Saw in one of my hostel books that there was a hostel no far in a town called "Deadwood". Never heard of Deadwood before. Didn't know what to expect. I was surprized to find out that it was quite a popular little tourist town. Happy people. Gambling places everywhere. But not like Las Vegas. It was good because people seemed to park their cars and walk around the town. So there was hardly any traffic. No jams, no horns blowing. Deadwood turned out to be a national historic landmark--a partial replica of a wild west town. And the resting place of Wild Bill Hickok and Calamity Jane. Glad I didn't continue on that evening to Mount Rushmore. I heard on TV that around 10,000 people were crammed into that area to attend the Fourth of July celebration & firework. I happily went to bed in my nice, cool room at 7PM. 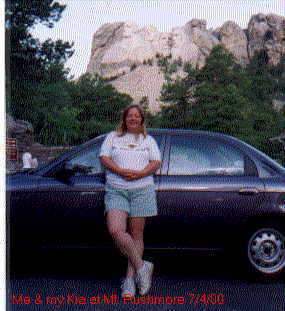 Above: Mount Rushmore, Me, and my Kia. I wasn't supposed to park here, but it was the only place where I could get both my car & Mount Rushmore into the photo together. It took only a minute. Nabbed a passing tourist and asked him to please take the picture. Got up and left Deadwood at 5:30 AM. Mount Rushmore was 50 miles from Deadwood so I got there early enough for the breakfast buffet right there in their cafeteria/restaurant overlooking Rushmore. After Mount Rushmore (the gift shop & post cards), I headed for the famous Wall Drug Store on I-90 in S.Dakota. Good place for a family with kids who need a break from riding in the car. Mostly a huge tourist trap. Way too hot & crowded for me. Decided not to visit "Badlands National Park" because I had seen so much of the deserts of the southwest including Death Valley. At that point I wanted to stick to the main roads for awhile. Above: Famous Wall Drug (I had never heard of it before this trip). It's not just a drug store, it's like a shopping center laying out in the sun--a shopping mecca. No trees. 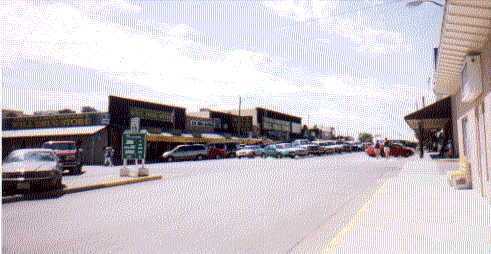 Just cars, and people shopping. And there was nothing special about the prices. But it was a good place to stop for a huge glass of ice water! Evening was approaching. Had to find a place to stay for the night. No local hostels indicated in my books. Had to stay at a campground--KOA in Sioux Falls, SD. It was still hot & muggy. They had a noisy, crowded pool. I did some laundry, took a shower, and went to bed.